Explain the structural, construction, and aesthetic benefits of exposed steel hollow structural sections. Identify the fire-protection and structural benefits of concrete-filled HSS as compared to other exterior fire-protection methods. List the variables that will determine the calculated level of fire resistance delivered by the concrete-filled HSS members. Discuss construction efficiencies and best practices for erecting the steel and piping concrete into HSS tubes. Define the benefits of a performance-based design approach over prescriptive design when specifying concrete-filled HSS. As exposed elements, HSS eliminate the need to furnish and install column covers, minimizing the column’s profile. The tubular form in particular presents a clean, exposed steel surface that exudes a modern appearance. Exposed steel offers an appearance that is often missing in other types of construction, explains Dr. Venkatesh Kodur, director of the Center on Structural Fire Engineering and Diagnostics at Michigan State University in East Lansing, Michigan. It provides not only the illusion of larger, more uninterrupted space by its slim profile but also a visual cue that the structure is both sound and in good condition. 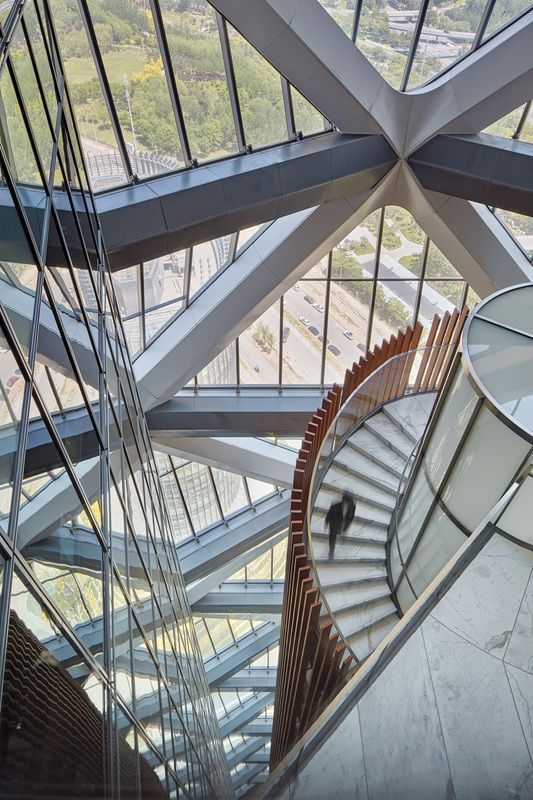 As pictured here at London’s Moorgate Exchange (bottom) and Beijing’s Boy International Plaza (top) concrete-filled exposed steel hollow structural sections present a beautiful aesthetic, a smaller structural footprint, and cost-effective fire protection. Available in round, square, or rectangular tubular forms, HSS deliver a clean, simple aesthetic. Each shape has rounded edges that effectively soften its appearance and minimize shadows. 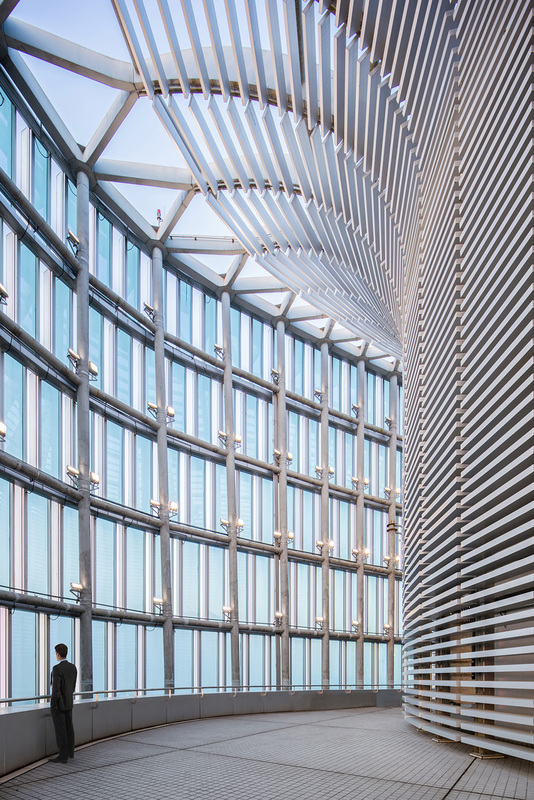 “When used as columns, the way light bends around the round HSS shapes in particular can make them appear slimmer,” says Andrea Reynolds, S.E., P.E., LEED AP, director of structural engineering, SmithGroupJJR, Detroit. Structural engineers are drawn to the high capacity-to-weight ratio and excellent torque and resistance of HSS, while building owners, architects, and engineers alike appreciate their clean, visual appeal. “Exposed steel provides a rugged industrial look, providing a sense of authenticity and direct feel for the structure of a building that is appealing to many clients,” says Ali Ashrafi, Ph.D., P.E., LEED AP, associate principal, Thornton Tomasetti, New York. As a torsionally stable member, HSS eliminate the need for other structural bracing members, thereby reducing clutter, simplifying the structure, and producing a more elegant solution, adds Preetam Biswas, P.E., associate director, senior structural engineer, SOM, New York. They also eliminate the need for formwork, which typically accounts for one-third of concrete construction costs. “Structural hollow sections are particularly suitable for exposed steelwork, as they do not have reentrant corners, are easier to paint, have a smaller perimeter, and give a smoother appearance,” explains Yong Wang BA, Ph.D., CEng, FIStructE, professor of structural and fire engineering at the School of Mechanical, Aerospace and Civil Engineering, University of Manchester, United Kingdom. He adds that circle-shaped sections are the most efficient shape in terms of compression. “This means for an equal steel weight, the column will be smaller, with a reduced footprint, as compared to other shapes, resulting in increased leasable area for building owners,” he says. This is particularly applicable in high-rise construction, which has high compressive loads. 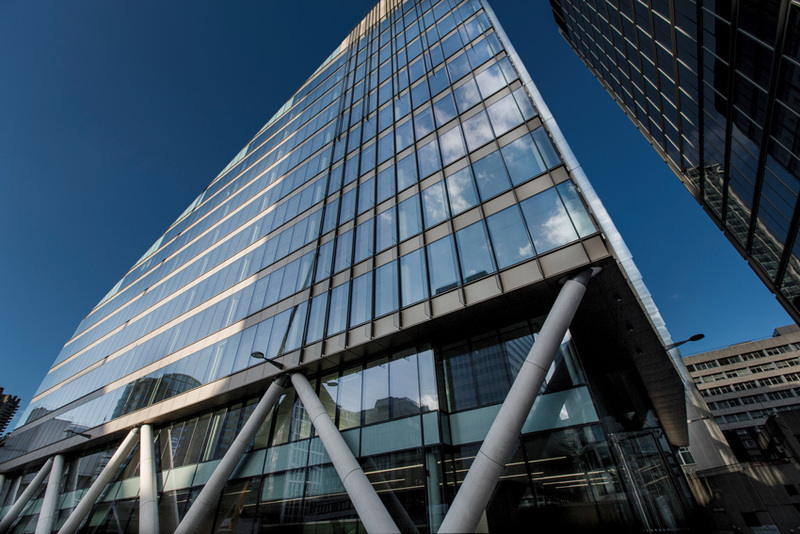 In fire-rated applications, external fire-protection methods for HSS are not only expensive but also cover up the exposed steel, negating its aesthetic appeal. Fortunately, concrete-filled HSS offer a solution. In addition to meeting a building’s fire-protection requirements, this method retains the beauty of HSS as an architectural element and enhances each structural member’s load-carrying capacity. “These two materials—steel and concrete—complement each other in that the steel section confines the concrete laterally, allowing it to develop its optimum compressive strength, while the concrete, in turn, enhances resistance to elastic local buckling of the steel wall,” Kodur says. SOM specified concrete-filled hollow steel sections for the Ningbo Bank of China Headquarters in Ningbo, Zhejiang, China, described as a site-specific tower with the exterior’s triangular shape and rounded corners gradually rotating around a vertical axis facing the city, the mountains, and the sea. 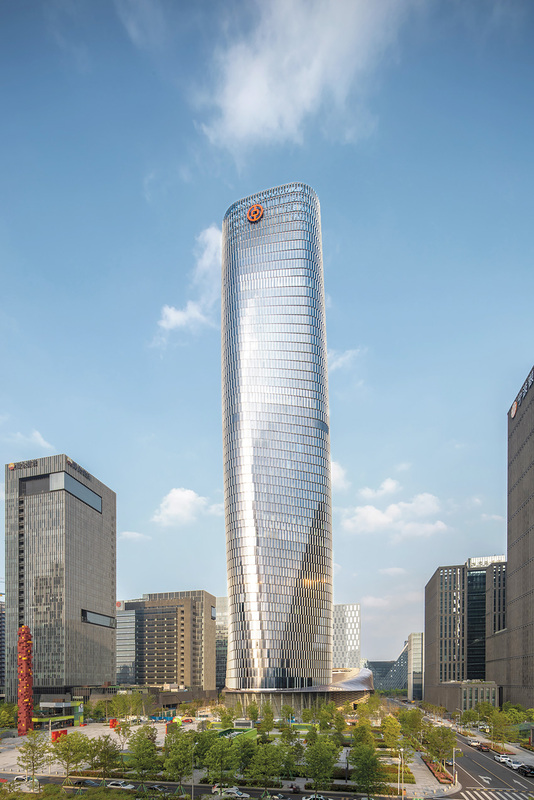 At the Ningbo Bank of China Headquarters, 400-millimeter-diameter to 850-millimeter-diameter concrete-filled hollow structural section columns with wall thickness ranging from 15 millimeter to 25 millimeter deliver structural support and fire protection. In terms of other HSS benefits over conventional steel columns, Ashrafi points out that the strength of the steel HSS columns is determined not only by their section areas but also by how far most of the section material is from the center of the section, which is called the radius of gyration. “By placing all of the material on the perimeter of the section, an HSS shape increases this distance, hence reducing the propensity of the column to buckle and achieving higher efficiency in comparison to I-shape steel columns,” he explains. In addition, concrete-filled HSS sections have less exposed surface, as compared to regular I-shape columns, thereby reducing the cost of intumescent paint and other fireproofing. Because of their closed shape, HSS columns are stronger than a wide-flange with the same weight, explains Kim Olson, P.E., technical consultant to the Steel Tube Institute with FORSE Consulting, Denver. Although the price per pound of HSS generally exceeds wide-flange I-beams, less steel is required and the increased capacity of an HSS is so much greater that these columns are ultimately more cost effective.